Physical activity and active living are keys to quality of life for Canadians. Community events provide a perfect opportunity to promote active living for everyone - including persons with a disability. To help ensure this full participation, ask yourself the following: Do you . . .
respect a person with a disability as an individual with equal rights to quality of life and independence? realize that the most common barriers to full participation are negative public attitudes? take the time to find out what a person's abilities or interests are without making false assumptions? ensure that your facility is physically accessible? Remember, providing access to changing rooms, washrooms and activity areas is as important as having a front entrance ramp. produce your communication and promotional materials in alternative formats, such as braille, large print or audio file? realize that a person who is deaf or hard of hearing has a preferred way of communicating? offer your help? It may be welcomed. A person with a disability will tell you how best to assist, but don't insist or be offended if your offer is turned down. 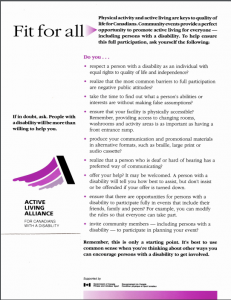 ensure that there are opportunities for persons with a disability to participate fully in events that include their friends, family and peers? For example, you can modify the rules so that everyone can take part. invite community members – including persons with a disability – to participate in planning your event? If in doubt, ask. People with a disability will be more than willing to help you. Remember, this is only a starting point. It's best to use common sense when you're thinking about other ways you can encourage persons with a disability to get involved.